The Georgia State women’s soccer team is poised to begin play in the Sun Belt Conference Tournament on Oct. 31. The Panthers (7-9-1) earned their first tournament berth since the 2015 season. They finished fifth place in the conference’s regular season standings. This season didn’t seem destined for the level of success the team has seen. The team began the year 2-8-1 and 0-4 in conference play. It looked as if this year would go down as another season of rebuilding under second-year head coach, Ed Joyce. Senior forward, Caitlyn Ray, is one of the only remaining players from the 2015 championship game season. Ray, along with junior, Brooke Shank, leads Georgia State in points with 11. She is tied for third in the Sun Belt with five assists alongside Jordan Kondikoff of Texas State and Natalie Melillo of Troy. The same talent that has been on the roster since the Panthers’ opening day loss finally came together to play well at the right time. Georgia State is entering the conference tournament this season with a winning mindset. The team confidence is at a level unseen since the team’s last tournament berth, and the Panthers look to translate that to their tournament play. The Panthers ended this regular season with momentum heading into the tournament, and they are focused on making it to the title game. 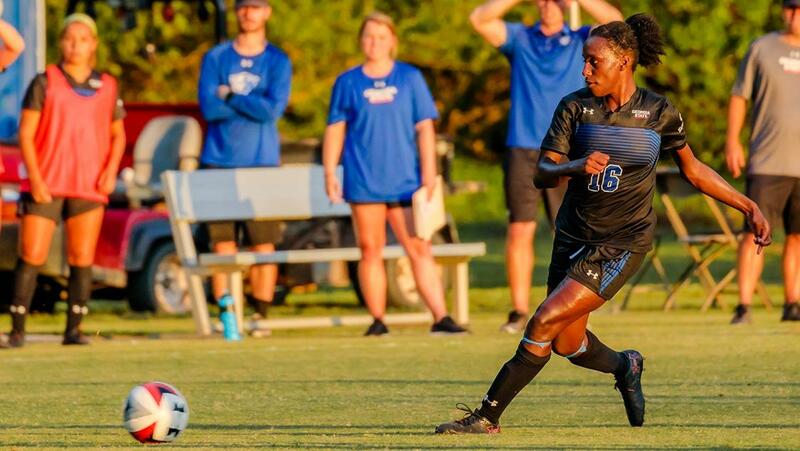 After losing to Arkansas State on Sept. 23, Georgia State went on to win five games in a row, including a 1-1 tie against top-ranked Texas State in San Marcos, Texas. The points earned from the stalemate helped the Panthers solidify their place in the conference tournament. When the Panthers played in the tournament in 2015, the team had an unimaginable run beforehand in which they took down top-ranked competition as the No. 6 seed to get to the championship game. They would lose 4-0 to South Alabama in the championship game. That season, Georgia State took down the No. 3 seed Texas State and the No. 2 seed Troy, winning the match via penalty kicks. The match against Troy in the semi-finals is one that still sticks with Ray today. She said the game was one that college athletes dream of being a part of. That is the same energy that Ray is trying to instill in her squad as the tournament rolls around. Georgia State entered the 2015 tournament with four freshmen on the roster. This year’s team enters the tournament with a host of younger players – 15 players on the roster are freshmen – who have yet to experience tournament play. Five of the first-year Panthers started nine or more games this season. Ray said she and the team’s other senior players are making sure their younger teammates are not too overwhelmed by the moment. “[J]ust continue to play the way we have been playing and not to let the tournament pressure affect your game,” Ray said. Ray will also take her experience as a young freshman who started 11 matches in the regular season that year and apply it to her tournament play as a senior – and leader – on her team. As a senior, Ray has the opportunity to lead her team along with Shank, the team’s top goal earner, to the Sun Belt Conference title as she exits the program. The chance to capture the title that she came so close to winning her freshman season has stoked her competitive fire. “[K]nowing that this is my final season and that at the end of the road could be a championship title I am more motivated than I have ever been,” Ray said.